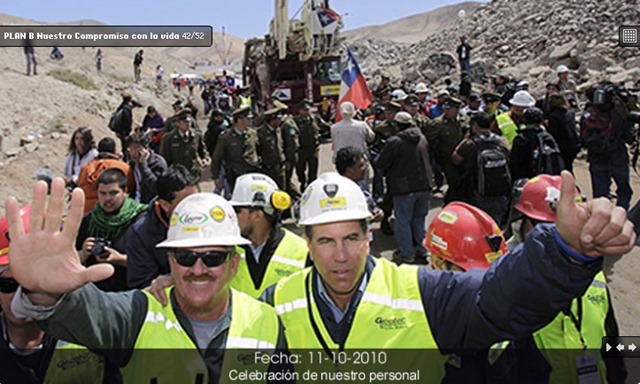 As 33 trapped miners waited more than 2,000-ft underground for their rescue, a whole team of Chilean government officials, mining engineers, equipment manufacturers and of course drillers came together get the job done. Jeff Hart, a driller from Denver, Colorado was one of the stars of the day. Hart was in Afghanistan drilling deep water wells when he got the call and hopped on a plane. 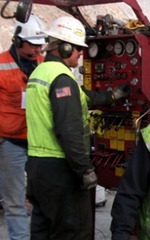 He works for Kansas-based Layne Christensen, and along with 3 other Layne employees, he manned the Schramm T130 drill rig that was part of “Plan B” that eventually became the shaft from which the trapped miners were rescued. On the drilling platform overseeing the drilling was James Stefanic of Layne, and crew members Matt Staffel, Doug Reeves and Jorge Herrera. The rig and I presume some of the support equipment was owned by Layne’s Latin America affiliate, Geotec Boyles Bros, SA. The drill bits were from Center Rock, Inc. of Berlin, Pennsylvania. The Center Rock CEO, Brandon Fisher, was on site throughout the operation as well. 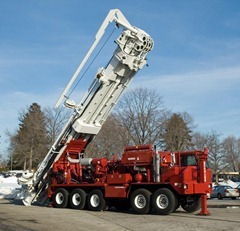 Before Hart and his crew ever got to the site, the initial borehole that located the miners and provided a conduit for food, water, supplies and communication was drilled by a Schramm 685 rig. 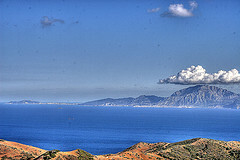 That occurred 17 days after the miners were initially trapped. Three plans were derived by the Chilean government to provide the best chance for rescue, referred to as Plans A through C. Initial estimates were that the rescue would take until Christmas, but Hart and crew beat that mark by over 2 months! The rock was an abrasive and very hard quartzite. Plans A and C were utilizing conventional rock coring techniques to drill the holes. 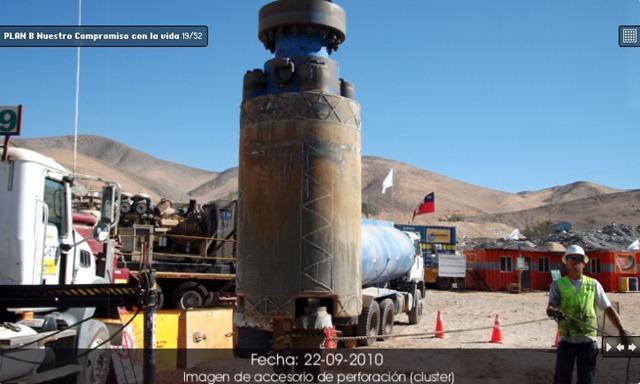 But despite some initial reservations by the Chilean government, Fisher and others convinced them that Center Rock’s down-hole hammer bits on the Schramm T130 drill rig would work for this job. They first drilled the 2,040-ft with a 5-in hole, then reamed it to 12-in, and finally to 26-in diameter, large enough to fit the Phoenix rescue capsule. Once that jubilant breakthrough moment occurred, the stress was lifted from the drilling crew, they had gotten their job done. 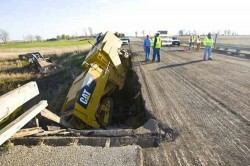 Before the Schramm T130 moved off the hole, the shaft was inspected by video camera. Based on the inspection, Mining Minister Laurence Golborne decided to reinforce less than 315-ft of the top of the shaft with steel casing. He defended his decision, saying it was purely technical and based on the input from a team of eight geologists and mining engineers. After 33 days, the Layne/Geotec/Schramm/Center Rock team had reached the 33 trapped miners. 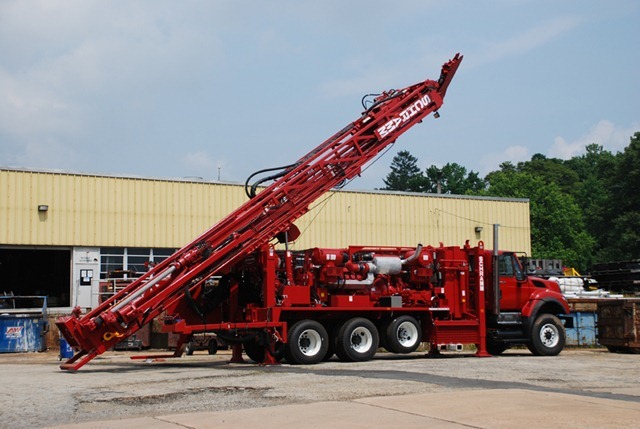 Several days later, the Schramm rig demobed from the site, but in a fashion that is quite unusual in the drilling profession. Jeff Hart and the rest of the crew were essentially paraded out in front of the drill rig, surrounded by police and grateful family members of the miners. 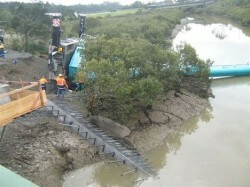 Hart and crew didn’t stick around at the site, but moved out of the way to let other teams complete the rescue. They flew to the Santiago office of Layne/Geotec where they watched the rescue. 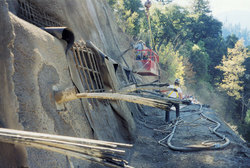 Photo credits: Geotec Boyles Bros, SA; Schramm Inc.; Center Rock, Inc. Excellent graphic showing the mine, the various boreholes drilled and other information. 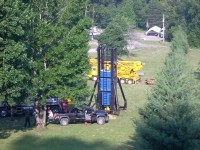 Center Rock Inc. in Berlin, Pennsylvania provided the drill bits to the ‘Plan B’ drill rig that drilled the hole through which the 33 trapped Chilean miners were rescued. 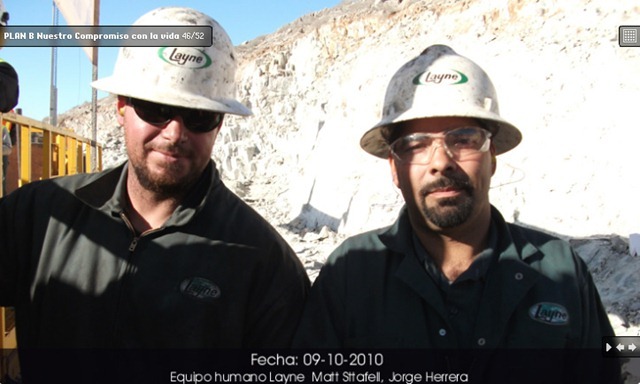 Andrew Schmitt, CEO of Layne Christensen, talks about his company’s role in the mine rescue. Reuters article with some quotes from Jeff Hart, the driller responsible for completing the Plan B rescue shaft. 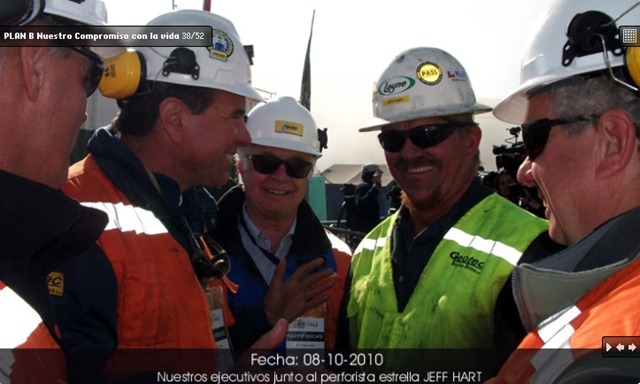 Video news story on Jeff Hart returning home to Colorado. 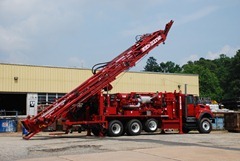 Schramm Drilling Rigs – Source: Schramm, Inc.
Manufacturers of the Schramm T685 drill rig that first located the trapped Chilean miners, and the Schramm T130XD drill rig that drilled the ‘Plan B’ rescue shaft. 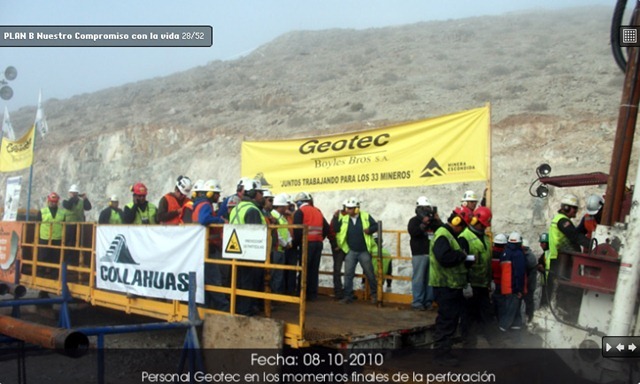 Geotec Boyless Bros S.A. is the Latin American affiliate of Layne Christensen that with the help of an American Driller, drilled the ‘Plan B’ rescue shaft for the trapped Chilean miners. 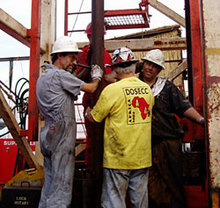 Their site has some great photos of the drilling in a Flash movie slideshow. 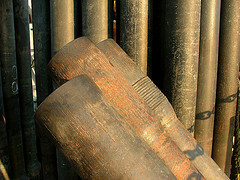 Drill bit manufacturers based in Berlin, PA. They manufactured the bits used to drill the ‘Plan B’ rescue shaft and provided on-site support throughout the operation. I talked to our local geotechnical/geoenvironmental drilling contractor to see if he has been affected by this shortage, and he said that he had, but that the supply shortages on all manner of drilling equipment and parts has been even more challenging. 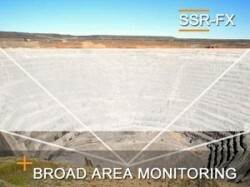 He cited the booming mining sector and their desire for exploration holes as a major source of his problem. He said one of his rigs had a broken overshot for an NQ coring system, that’s the device that attaches to the wireline and retrieves the inner tube from the drill stem while coring. 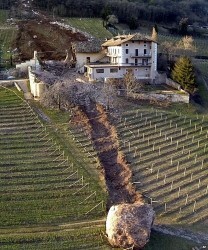 He said there wasn’t a single overshot in North America that he could buy! This was cool! Answered a lot of questions I had about the rescue. 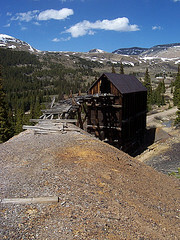 Could somebody explain the nature of the intial collapes of the mine? This is part of the story that is not mentioned much at all. Great. Congrats to all crew members. 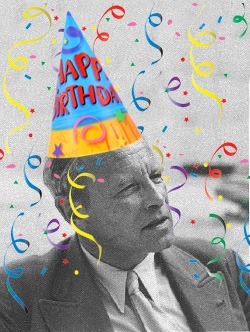 I actually wondered weher resistivity geophysical experiments were done to choose the best line for the drilling which would then be expanded for the resque capsle. I was with the resque operation by the TV set prayerfully all the time. Thanks to GOD no life was lost.